Quebec is Canada's second largest province, with an area of nearly 600,000 square miles. That's just a number, but when put in perspective the province of Quebec is three times the size of Texas. 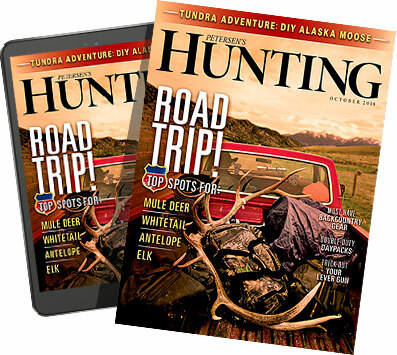 The caribou hunting in the far north is perhaps best-known to American hunters, with the Leaf River caribou herds part of hunting's legend and lexicon. However, the sheer size of Quebec dictates that she encompasses multiple distinct climatic zones. The famed caribou hunting is conducted in the far north, a vast area encompassing about 44 percent of Quebec's land mass. While the northernmost true tundra is both arid and barren, the taiga zone just south of Hudson's Bay mixes the tundra's lichens with small willows and conifers and provides ideal habitat for caribou. The towns of Kuujjuaq and Schefferville are the traditional jumping off points for caribou hunting. Farther south, as the climate grows more temperate, the trees become larger and denser, with the southern half of Quebec occupied by three distinct forest zones. Northernmost is the Canadian boreal forest, primarily a conifer forest with spruce predominant, interspersed with wetlands and bog. Farther south lies a transition zone of mixed forest, with deciduous trees (including Canada's signature maple) appearing in increasing frequency until, in the south, one finds deciduous forest much like America's Appalachia region. Black bear are well-distributed through both forest and taiga, with both spring and fall hunting. A few moose also make their way in the north, but the primary moose population makes its home in Quebec's forests. Whitetail deer are also well-distributed, but the more dense populations are found in the south and on famed Anticosti Island in the Gulf of Saint Lawrence. Rounding out hunting the picture is excellent waterfowl hunting, ruffed grouse and woodcock, and northern small game such as snowshoe hares. Under most circumstances visitors from the U.S. must engage the services of a licensed outfitter&apos;¦but here is where Quebec diverges from much of Canada. In Quebec speak, an "outfitter" offers access to an area, and the outfitter typically provides a camp and logistics support, but Quebec does not have a "guide law" requiring visiting hunters to be directly accompanied by a guide. This means that hunting in Quebec spans the gamut in services and accommodations, as well as price. Though English is widely spoken, French is the official language of Quebec, and there is great pride in the French heritage. In 1534 Jacques Cartier landed on the Gaspe Peninsula and claimed the land for France. In 1608 Samuel de Champlain founded Quebec City, still the capital of the province. With heritage like that one might expect five-star lodges catered by French chefs, and such can definitely be found if that suits one's interests and budget. But there is also the full run of "semi-guided" and "do-it-yourself" hunting from basic wilderness camps. Obviously the right fit depends not only on one's budget, but also experience. It probably isn't a good idea for either new hunters or older hunters with infirmities to plan on wandering around the northern wilderness by themselves. The point is, Quebec has it all! My first Quebec hunt, clear back in the early 80s, was a fully guided caribou hunt. Several subsequent hunts have been semi-guided (a nuance meaning an experienced hand ran the boat and directed hunters to good locations); and unguided (meaning we ran the boats ourselves or struck out from camp on foot). All have been successful. This is perhaps an unusual track record, because caribou migration patterns are extremely reliable&apos;¦until, suddenly they are not! It isn't exactly a feast or famine situation; migrating caribou are spread out over a vast area, and will take days and often weeks to pass a certain point. Only once, in northern Quebec, was I fortunate to catch the true spectacle of a caribou migration, with herd after herd appearing on the horizon and marching past. Other times I've been early, I've been late, or I just plain missed it, but there were always plenty of caribou around — we just had to look a bit harder! And the country was always spectacular. The majority of Quebec hunting camps will be reached by floatplane, truly the great enabler for northern hunting. Obviously some outfitters (and their camps) specialize in moose; others black bear. While Quebec's abundant black bears can be encountered almost any time (and can be taken, given open season and license), black bear hunting at its best is a specialized pursuit. Baiting is the preferred methodology in Quebec, and can be very successful in both spring and fall. There are wonderful opportunities for waterfowl, and many outfitters offer upland game and small game. While there is good whitetail hunting on the southern mainland, on Anticosti Island whitetail hunting is an industry unto itself! Running about 135 miles long and 10 to 30 miles wide, the island is virtually uninhabited by humans. In peak years it can hold 150,000 whitetail deer! The terrain is largely thick forest with many bogs, so the hunting isn't easy, but it's natural habitat for northern whitetails and offers whitetail hunting like it might have been 150 to 200 years ago in much of the East. Anticosti is an experience every whitetail hunter should have at least once. Let's see: Beautiful country, plentiful and varied game, and a network of outfitters anxious to welcome hunters. What else should be said? Well, there are two other conditions that make Quebec especially user-friendly to American visitors. First, a long border is shared from New York to Maine. Many hunters in the Northeast simply drive to jumping-off points for hunting destinations in Quebec, but if this isn't appropriate there is excellent internal air service from Montreal and Toronto. And just one more thing: The current exchange rate between the U.S. and Canadian dollar is the most favorable it has been in many a year, making a Quebec expedition more affordable than ever before. For more information about planning your next hunting adventure, check out Quebec Outfitters.